There are many rooms on-board for our passengers to have a comfortable voyage. Such as, single rooms for one, and rooms you can rent with 4 passengers. There are many rooms on-board for our passengers to have a comfortable voyage. Such as, single rooms for one, and rooms you can rent with 4 passengers. Dinner is a buffet with Japanese, western, Chinese style cuisines. Breakfast will have Japanese set, western set and morning curry. There is a big bath and sauna for everyone to use. Please enjoy the ocean view from the big windows. ※There is possibilities of not being able to use due to weather conditions. Slippers, magazines, alcohol, snacks, toiletries and souvenirs are sold. Also, we are lending bed sheets and towels at the information center. ※We do not advise drivers to buy alcohol to eliminate drunk driving. ※We don't sell drug medicine. 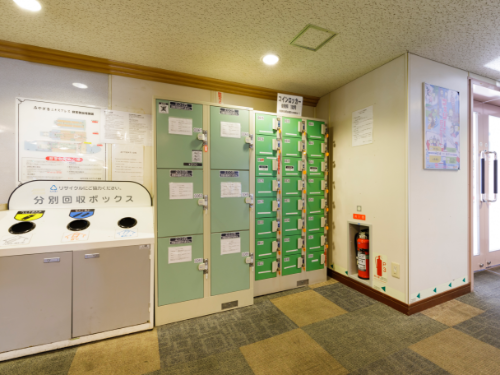 ※There are vending machines on the 4F joint space. There are two sizes to the coin locker. 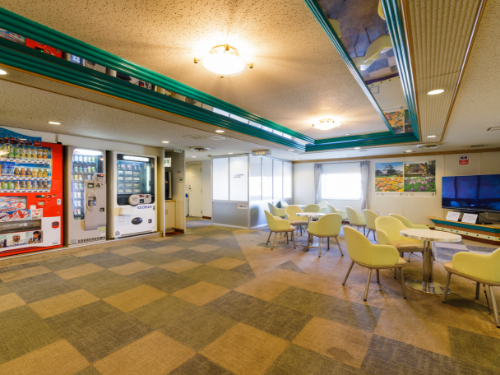 There are tables and chairs on the 3F joint area with a TV and the corridor next to the restaurant, and on the 4F lobby area. Anyone is allowed to use this area. Smoking space There is a space for smokers. You can see the night view from the port when leaving Kobe, and you can see and enojoy the great nature view from the deck at morning and night.